2002 - the year of the flicker?? Its too soon to tell, but so far, so good. 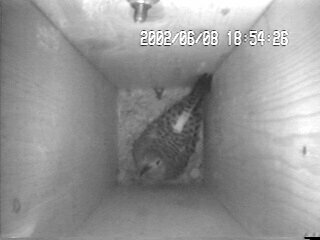 After last year's nesting failure due to the relentless pressure from European starlings, this year began on the same note. 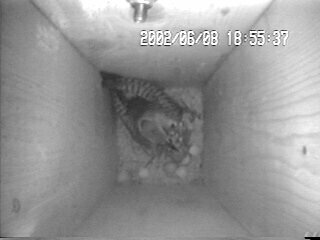 The flickers were alternately trying to protect the nesting cavity in a front yard sycamore which they had dug last year and the nest box in the barnyard where they had begun nesting last year. As before, starlings were continually gathered around them at the sycamore hole. 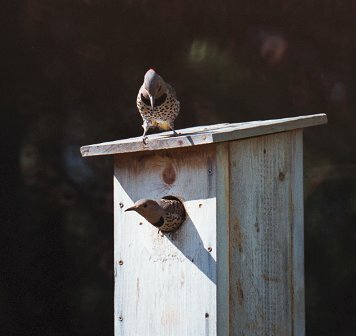 A dozen starlings were trapped at the barnyard nest box with a hole cover trap in just a few days, creating an opportunity for the flickers to nest. 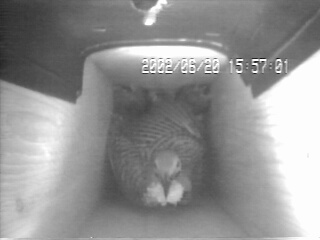 They began protecting the box by taking turns perching on top, in the entrance hole or inside the box. 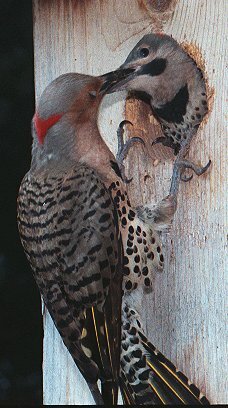 Flickers do this long before the first egg is laid. During this time I witnessed a fierce battle inside the box. Finally the male flicker emerged, looking quite bedraggled. He perched in the entrance for some moments, collecting his strength and catching his breath, before flying off, very low to the ground. 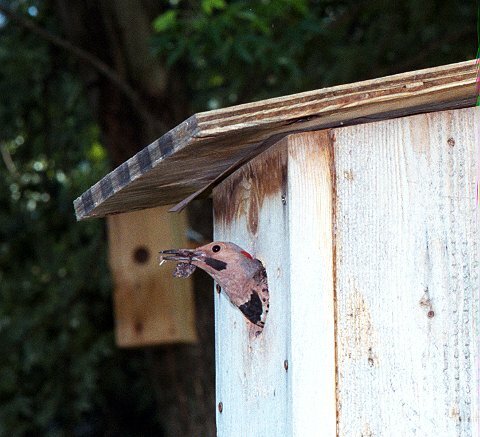 A few seconds later, a starling popped out of the hole and perched on top of the box. It flew off and immediately returned with nesting material. 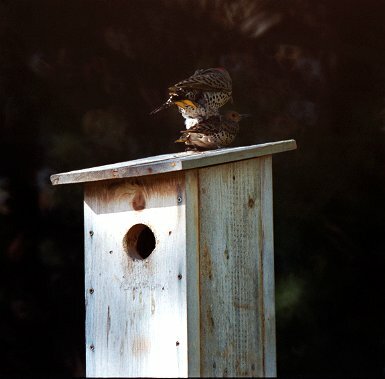 The starling was dispatched with a pellet gun, but the flickers didn't reappear that day. 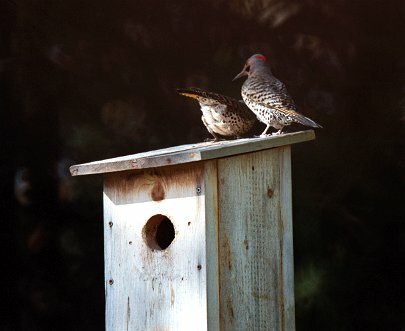 The next morning, the female flicker returned to the nest around 8am and after 4 or 5 minutes of cautiously peering into the box, entered. 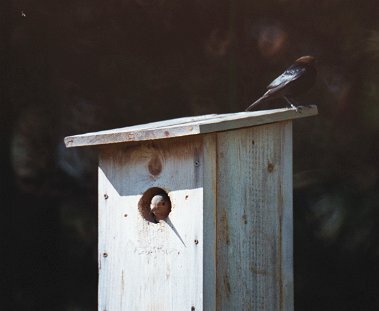 Not until mid-day did the male return, but once he found no danger, the pair began alternating shifts at the box as if nothing had happened. 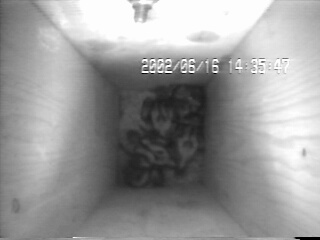 The clutch of 7 eggs was completed on May 26 and 5 hatched on June 5. 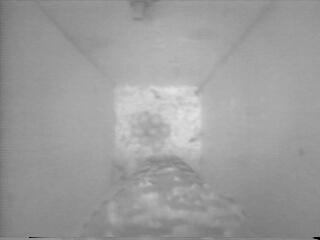 Incubation had begun when the 6th egg was laid on the morning of May 25, 11 days before hatching. 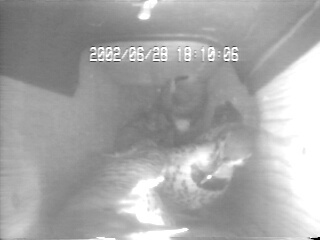 The male and female have about equally shared daytime incubation, with the male staying in the nest at night. 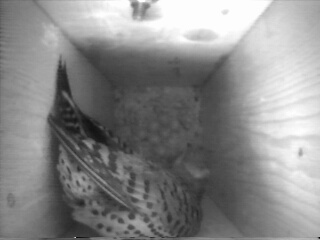 Likewise, the male is now brooding the nestlings at night, but both are frequently trading off this duty during the day. 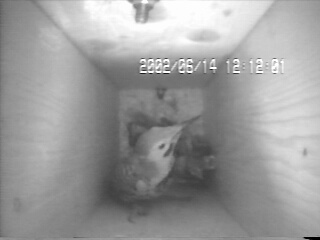 They have both become very vocal since the young have hatched. Another male flicker came today and the two males did a great deal of face to face posturing and a little bit of chasing and fighting, but NOTHING compared to the fierce battles they have had with starlings. This nesting is still in jeapardy from starlings. 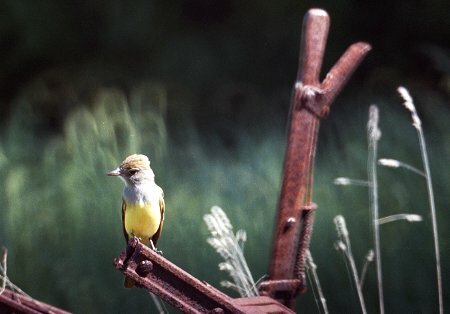 I shot two more this morning that had come in to display at the two empty boxes that I placed for the visiting great crested flycatchers. Today a microphone was placed in the flicker box. 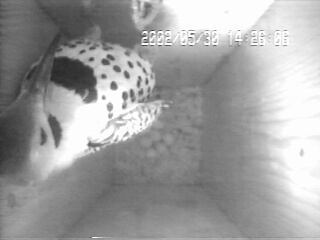 I usually don't bother with the extra equipment and cables for audio, but the 3 day old flickers are extremely vocal! They don't look like they are old enough to make any sounds at all, When the adults are away they always manage to form a circle with their necks overlapping in the center. 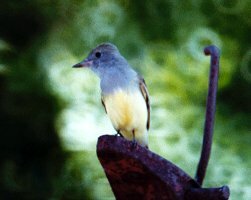 Like other songbirds of this age, they can't support their head yet, but can throw it from side to side in order to move around. 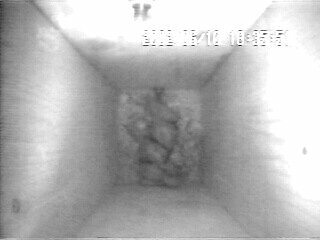 Their eyes, of course, won't open for days, yet the moment the entrance hole is blocked by a returning adult, they all begin calling loudly. I get the same response from them when I quietly cover the entrance without touching the box. 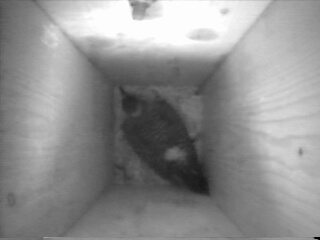 Even now, at midnight, the nestlings are crying quite loudly and the male appears to be trying to quiet them. Infrared video is really neat! 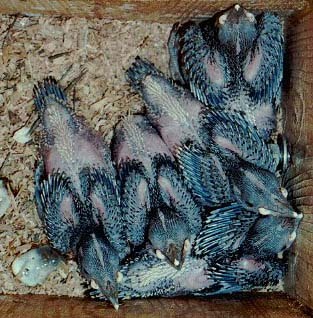 7/29/2002 update The flicker nesting went well, with 6 of 7 eggs hatching and 5 of 6 nestlings fledging. 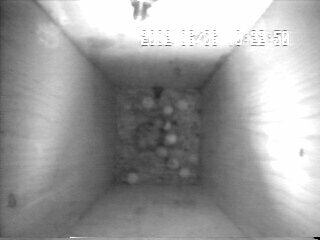 A total of over 200 starlings were trapped or shot in our yard and the flicker box was monitored for several hours each day. 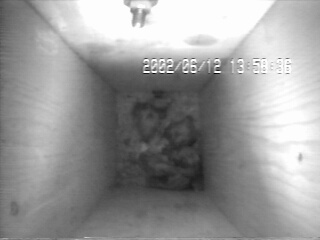 The few remaining starlings inspecting the box halfway through the nestling phase no longer entered the box. 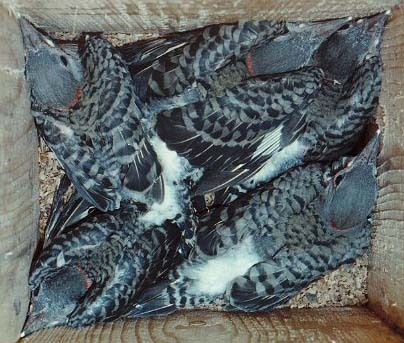 The thought of killing large nestlings and having them rot in the box was likely not appealing to the starlings. 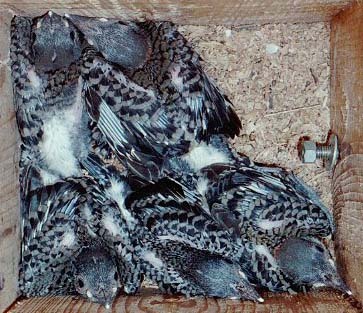 Unlike house sparrows, starlings generally intend to actually use a box when they kill the occupants. 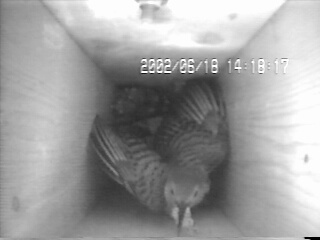 They visit boxes in pairs and often immediately begin a nest after claiming the box. 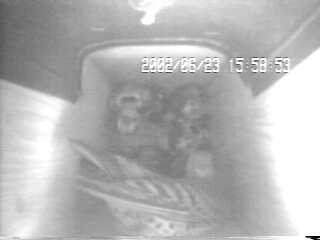 Male house sparrows often seem to want many nest boxes and as many mates. 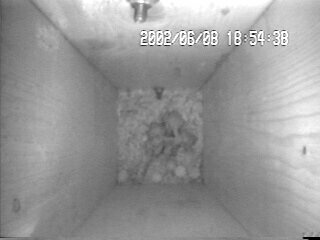 Luckily, house sparrows are rare on our property, although, this year, for the first time, one dropped in and killed a tree swallow in a nestbox. This is often reported where sparrows are common, but, seeing the evidence first hand has renewed my vigilance in regard to this second alien species. male cowbird on flicker box Even the craftiest of brood parasites may be caught on videotape this year! 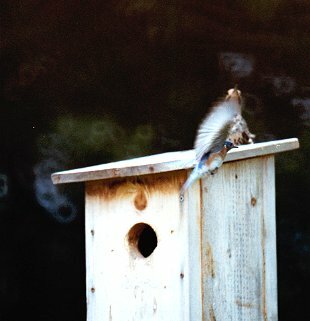 bluebird approaches flicker on nest box This bluebird currently has a nest in the barnyard and, in the course of a morning, perches on almost every object available. 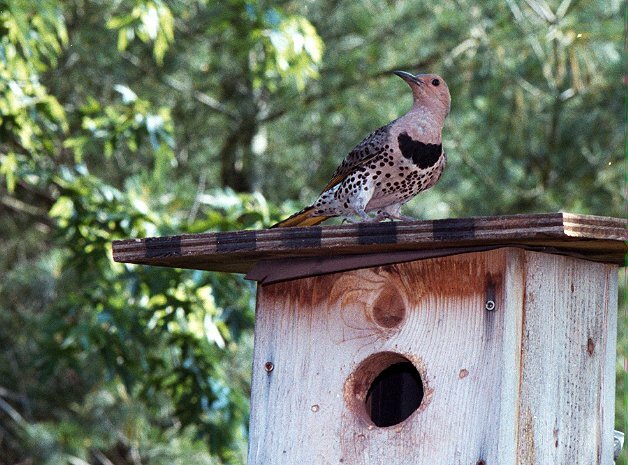 The flicker box was one of his favorite perches until the flickers began to jealously guard it. The following still photos are taken from a single frame of video from the vhs tapes. This process results in a substantial loss of quality compared to the original camera image and vhs tape. ©2002, 2013, American Artifacts and Richard Van Vleck, Taneytown, Maryland.